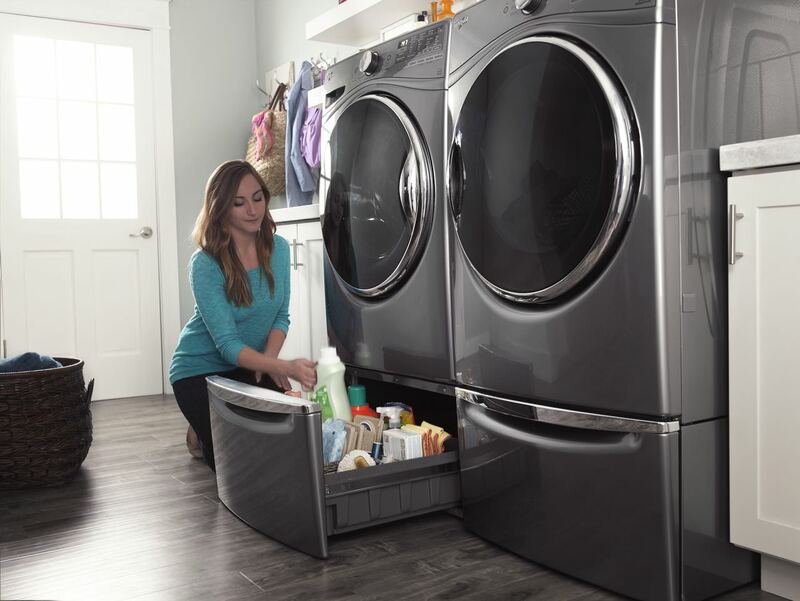 Since the average person spends at least six hours a week in their laundry room washing clothes, it's no surprise why homeowners crave a more organized and attractive laundry space. The laundry room has steadily been coming out of hiding in basements and closets and moving into more convenient areas of the home, such as the master suite, mudroom and off the kitchen and garage. In fact, most architects and designers are incorporating more detailed laundry rooms in their house plans so homeowners can create a comfortable and functional space for the whole family to enjoy. This sleep Chrome Shadow finish adds distinction to laundry appliances. You can boost this washer and dryer set on storage pedestals to raise them up and hide your detergents! Some of the more popular trends in the laundry room are a change to bold colors and designs. Up until a few years ago, you basically had a choice of white or cream colors with the occasional steel or black, but now you're seeing manufacturers offer a broader spectrum of colorful washer and dryers. You'll find rich colors such as Pacific Blue, Black Diamond, Wild Cherry, Emerald Green, Titanium, Ocean Blue, Tuscan Chestnut and Champagne, which add style and elegance to your laundry room. Unfinished or stark white walls have been replaced by bright colors to match these new and stylish washer and dryers, to enhance the look and feel of your laundry room. Organization is critical to ensure functionality and efficiency in the laundry room. Incorporating a storage system that meets your needs is a great way to get organized and depending on your budget you can add cabinetry. When you pick out your kitchen and bathroom cabinetry, be sure to see if they offer a line of laundry cabinets. It's a good idea to have your cabinets go up to the ceiling so you can store more and avoid dust collecting. This is one room where you can't have enough accessories to help with organization and multi-tasking, like all-in-one ironing stations, sorting and drying tables and units, storage space and a small soaking sink. These days, with such advancements in laundry and fabric care, there are many types of washers and dryers to choose from. Your task is finding the right brand and model for your needs and lifestyle. It goes without saying that your new washer and dryer should be ENERGY STAR® approved and water efficient. We all have our favorite brands, but with the rising cost in energy, now would be a good time to consider a higher-end brand like Miele, which manufactures one of the greenest washers on the market. According to Miele, one washer can save enough clean drinking water for 10 people for life. Their washers use very little detergent, water or energy and all Miele laundry systems feature an exclusive Honeycomb DrumT which is proven to help clothes last four times longer. Other high-end laundry systems to consider are LG and Electrolux, which offer their own exclusive technologies like quiet mode, steam wash and dry, wrinkle reducers, eco-wash cycles and much more depending on your laundry needs. It's that age old saying "you get what you pay for." Just like your kitchen appliances I'm sure your washer and dryer will need to perform regularly and efficiently, so why not spend a few extra dollars now so you can enjoy years of saving. Make sure that you allow space for a sorting and folding table, since there is nothing worse than putting dried clothes into a basket knowing they are going to get wrinkled before you have a chance to sort and fold them. Have your designer or builder incorporate a drying area in your laundry room. This will cut down on the energy you use to dry clothes that don't generally need a lot of drying power. Another great design element is having an ironing table either built-in or placed on a center island with storage cabinets underneath. A nice touch is to add a TV or audio system so you can really enjoy the time spent doing laundry, which could be hours.